Comments: An original orchestral score composed for a book? Why not? This is the first ever original orchestral score to be composed based on a book. Composer Joel McNeely has taken full advantage of the 90 piece Royal Scottish National Orchestra as well as their 150-voice choir and come up with an epic symphonic companion to the new Star Wars adventure Shadows of the Empire. After the introduction of the classic Star Wars main title we hear exciting symphonic portraits of the soaring Imperial City theme, the ominous new theme for Xizor and an array of exciting new space battles as well as a thrilling chase through Beggar's Canyon! This is one adventure which no one who loves Star Wars should miss. 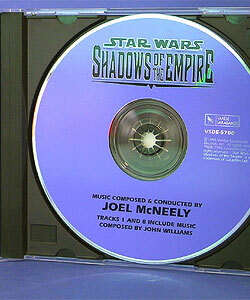 In addition to the soundtrack, the disc includes a computer interactive section that allows viewers to get an overview of the entire Shadows of the Empire project. 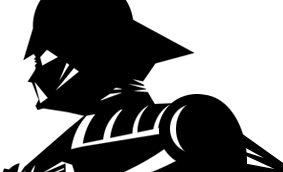 Included are biographies of the creative team, art galleries from the artists involved, documentation of the recording of the music by Joel McNeely and the orchestra, as well as a look at the other aspects of the multimedia crossover adventure.